Come and join us on the 2nd June for our Air by Night session. 2 hours of latest tunes. To celebrate the release of Wonder Woman and Pirates of the Caribbean we are holding a competition. 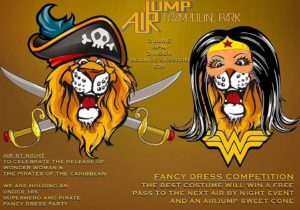 Who ever comes in the best fancy dress outfit will win tickets for the next Air by Night and of course the Airjump Sweet cone. Fancy dress is not required for this event but we would highly recommend to make a great fun night out.